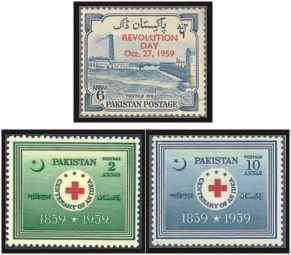 Pakistan Post issued three stamps on two occasions during 1959 as above. The stamp on top was issued on 27 October 1959 to commemorate the first anniversary of the Revolution Day. The stamp with an overprint "Revolution Day Oct 27,1959" was in fact earlier issued in 1955 showing the Textile Mills in West Pakistan. The stamp with a face value of 6 Ana was in ultramarine colour. A set of two stamps in the bottom row above was issued on 19 November 1959 to commemorate the first century of the establishment of the Red Cross. The stamp on the left had a face value of 2 Ana and green in colour, while the stamp on the right had a face value of 10 Ana and was blue in colour with the logo of the Red Cross in the centre. The stamps were withdrawn from the sale in April 1962. Lucky me that I have all three stamps in my collection as seen right above.